NEW YORK/WASHINGTON (Reuters) - A challenge by the U.S. National Labor Relations Board (NLRB) to Wal-Mart Stores Inc's treatment of striking workers is likely to become a critical symbol of labor unions' attempts to organize the many non-union workplaces in the United States in the face of stiff resistance from management. The wider implications of the showdown for Wal-Mart and other American employers that don't recognize unions are likely to be much more important than any costs the giant retailer may face if it loses the case, labor experts said. The NLRB, which oversees union elections and polices unfair labor practices, issued a complaint on Wednesday accusing Wal-Mart of violating labor law by firing or disciplining workers for strikes over wages last year in 14 states. The NLRB's complaint breaks new ground for the agency, which is bringing more cases involving non-union workers as it asserts its role in an increasingly non-union economy. Wal-Mart is the largest employer to face such a complaint in years. "This is part of a drive by the NLRB to further police employees' labor rights in the non-unionized workforce," said Paul Secunda, a professor of labor law at Marquette University. "If the NLRB can go after Wal-Mart and be successful, that sends a shot across the bow to all employers across the line - to employers that are similar in size, to smaller employers - that they are under the jurisdiction of the NLRB," he said. In addition, the Wal-Mart case weaves together complaints on behalf of 19 fired workers, as opposed to handling one complaint at a time. That makes it "precedent-setting," said Sarita Gupta of Jobs With Justice, a workers' rights group. If a settlement is not reached, the agency's case is likely to drag on for two to three years as it winds its way through agency proceedings and then up to a U.S. court of appeals. "In this procedural step taken by the NLRB, Walmart looks forward to the opportunity to shed some light on the facts of the case," Wal-Mart spokeswoman Brooke Buchanan said in a statement. "We believe we acted respectfully and most importantly lawfully. Walmart has a strict no retaliation policy and the associates who are included in the complaint were not terminated for participating or membership in an outside group, but rather for violations of other policies including attendance." An NLRB spokesman did not return a call seeking comment. Behind the clash is an ongoing struggle over the future of the American workplace between businesses and unions. Arkansas-based Wal-Mart and organized labor are old enemies, with the retailer determined to keep its U.S. workforce non-union, while unions try to make inroads among Wal-Mart's 1.3 million American employees, many of whom are lower paid. Between the two sides is the labor board, which is flexing its muscles again under Democratic President Barack Obama but is powerless to seek big fines against Wal-Mart. "A victory for the board and the union could have symbolic importance for unionizing drives across the country," said Michael Gold, a professor of labor law at Cornell University. "Just the opposite is true - if Wal-Mart wins the case, they are really going to trumpet it. They are going to tell their workers, with good cause, 'we did not break the law. The government persecuted us for nothing,'" he said. 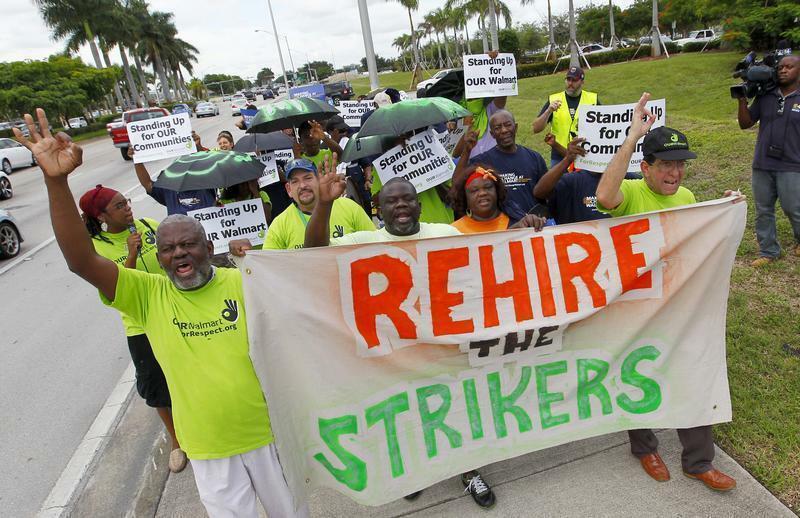 U.S. unions have been helping Wal-Mart workers push for better pay and benefits. In November 2012, protests occurred at Walmart stores nationwide. They resumed in early 2013, as picketers and workers demanded better working conditions in Texas, Florida, Illinois and California. The United Food and Commercial Workers International Union (UFCW) and a group known as Organization United for Respect at Walmart, or OUR Walmart, have assisted the strikers and brought allegations of unfair labor practices to the NLRB. Wal-Mart has until January 28 to respond to the NLRB complaint, which was brought by the general counsel's office of the agency. After the response, Wal-Mart and the NLRB would participate in a trial-like proceeding before an agency administrative law judge. Any decision by that judge would be reviewed by three of the five board members of the NLRB, the top officials at the agency, based in Washington. Board members are presidentially appointed; three are Democrats and two are Republicans. If the board members find an unfair labor practice has occurred, they will issue an order against Wal-Mart, but they must go to an appellate court to enforce it. The NLRB has little power to extract much from Wal-Mart. It cannot fine the company. The agency could require payment of back-pay for the workers, reinstatement for lost jobs and request that the company post notices about workers' rights. "By Wal-Mart's standards it's not likely to be a lot of money," said Julius Getman, a labor law professor at the University of Texas. But Wal-Mart will likely fight the case because "it's a cost of doing business and staying non-union," he said. At almost any stage in this process, the NLRB and Wal-Mart could reach a settlement that would halt further proceedings. No matter how long it plays out, the case will not only be a test for Wal-Mart, but for the NLRB and organized labor's attempts to adjust itself to an economy based less and less on factory workers and more and more on service employees. The portion of all U.S. workers belonging to a union fell to 11.3 percent in 2012, compared with 20.1 percent in 1983, according to the latest data from the U.S. Department of Labor. In the private sector, only 6.6 percent were union members in 2012. As union membership has dwindled, the NLRB has increasingly tackled cases involving non-unionized workers. Secunda cited cases involving private-sector workers using social media to organize against employers, including a 2012 decision involving Costco Wholesale Corp's social media policy. Private employers will be watching the case, said Richard Block, an attorney with law firm Mintz Levin Cohn Ferris Glovsky and Popeo who represents companies in labor disputes. "It's all about the union drive, as opposed to the particular facts," said Block. "It's bigger than the particular facts."